Some 200 firefighters have been tackling a blaze today at the Ocado warehouse in Andover. 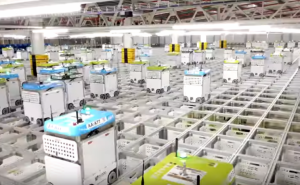 Over 30,000 orders a week are processed here by the famous Ocado order fulfilment Robots. No Ocado staff are believed to be injured but there is little hope for the robots trapped inside. Questions will surely be raised about why the robots did not respond to fire systems and make their way to safety. This article may be a little light hearted but we do wish the firefighters a very safe day ahead in their battle with the blaze.